Built at the famous English Electric Vulcan Foundry Works, Newton-Le-Willows, Lancs, this was one of twenty Class 40's (D325-D344) constructed with split box route indicators, displaying the train reporting number with two digits on either side of the gangway doors. The locomotive entered traffic on the 11th March 1961 allocated to Crewe North shed (5A) where she remained until April 1966 when she was allocated to the London Midland Western Lines. June 1968 saw her re-allocated to D05 Stoke-on-Trent Division where she remained for eleven months before being re-allocated to D09 Manchester Division in April 1969. In January 1972 the locomotive was re-allocated to D08 Liverpool Division and remained there until May 1973 when she was re-allocated to Wigan Springs Branch depot. Three months later in August of that year, the locomotive was on the move again, only this time heading north for the first time in her career to Carlisle Kingmoor depot. In May 1974 the locomotive was re-numbered to 40135 and dual braked at Crewe Works during an overhaul in December 1975. The locomotives final depot allocation was Longsight depot Manchester from May 1975. The locomotives final working on BR was the Heaton-Manchester Red Bank empty vans on the 20th January 1985. From the carriage sidings at Manchester the locomotive travelled light engine to Newton Heath depot and was withdrawn from traffic on the 22nd January 1985, after giving some twenty four years of loyal service to BR. The reason given for the locomotives withdrawal was life expired (rundown of the class). Four days later the locomotive was moved to Healey Mills, en-route to Doncaster Works for cutting up and arrived at the Works on the 28th January. However after several months of speculation, 40135 was reprieved from the scrap line at Doncaster Works and re-allocated to Crewe Diesel depot for use on the Crewe Station remodelling program. The locomotive finally departed from Doncaster Works on the 15th April 1985 and was dragged towards Crewe depot behind 31134. Once at Crewe, the locomotive was officially re-instated to traffic on the 8th May and given a departmental number of 97406 and restricted to a maximum speed of 35 mph. 97406 were finally withdrawn from traffic at Wigan Springs Branch depot at 11:00 on the 16th December 1986. Later that same day the locomotive was dragged by sister loco 97405 (ex-40060) from Wigan to Bescot Yard, en-route to Swindon Works for cutting up. However due to the Christmas period, the loco remained at Bescot until 28th December when she was moved to Gloucester by 20042 still en-route to Swindon. With several groups interested in preserving the locomotive BR decided to store the locomotive at Tyseley for the foreseeable future, so on March 2nd the locomotive was moved back to Bescot by 31309 and forward to Tyseley the next day behind 47567. With the depot staff at Tyseley planning a mini open day on Sunday 4th October 1987, attention turned to the two Class 40's stored on the depot, namely 40013 and 97406 (ex-40135). After various decisions it was decided to re-paint the split headcode member of the class in original Brunswick green livery with small yellow warning panels and numbered D335. Three days after the open day, the locomotive was dragged with D9000, 55019 and D4 from Tyseley depot to the Severn Valley Railway for their forthcoming diesel event. On Saturday 10th October D335 worked the 15:04 service from Bridgnorth to Kidderminster, returning on the 17:00 service back to Bridgnorth. Then the 20:30 "Beer Ex " back to Kidderminster before returning on the 23:30 service to Bridgnorth. On the Sunday she worked the 15:04 Bridgnorth-Kidderminster service, returning back to Bridgnorth on the 17:00 service out of Kidderminster. Following the Severn Valley event, both D335 and D9000 headed for Hereford on the 15th October to take part in a Rail-Week exhibition at Hereford Station. From here the convoy headed towards the GWS headquarters at Didcot, for another open day event planned for Saturday 24th October. Five days later, the locomotive returned back to Tyseley depot behind 31285. Having spent the winter months at Tyseley depot, the locomotive was dragged to Birmingham Snow Hill Station on 23rd April 1988, for a display to promote the West Midlands “Mid-Line " services. After the event the locomotive was dragged back to Tyseley depot by 31413. On the 6th May 1988, the locomotive was dragged with 55015 from Tyseley depot to the Severn Valley Railway at Kidderminster by 20170 in order to take part in the forthcoming diesel gala. However, due to tender forms being sent out for the sale of the locomotive, the Severn Valley Railway was unable to use the locomotive at this event apart from display purposes only. On the 21st June 1988, 97406 moved in error from Tyseley depot to Washwood Heath Yard along with 27059, which was en-route to Vic Berry’s Yard for asbestos removal. However after BR realised the mistake, the loco was taken straight back to Tyseley depot. During early 1988 the locomotive was offered up for sale by tender and successfully purchased for active preservation by The Class Forty Preservation Society, who at the time already owned 40145 which was based at the East Lancs Railway. However, before the group could take delivery of the locomotive, she needed to visit Vic Berry's Yard at Leicester for asbestos removal. On the 6th September 1988, 97406 travelled under its own power from Tyseley depot to Leicester and therefore held the honours of being the last Class 40 to work under its own power on BR metals. After asbestos removal the locomotive left Vic Berry's on 12th January 1989 and travelled to Toton depot. The following day she was tripped over to Bescot Yard by 20070/072 and forward to Crewe depot on the 16th January by 47053. After receiving some work at Crewe depot the locomotive finally arrived at the Eat Lancs Railway on 6th February 1989, hauled by 31107. On Sunday 27th May 1989, 40135 burst into life for the first time in preservation, and apart from a few minor adjustments everything was working fine. For the East Lancs October 1991 diesel gala the group repainted the locomotive in all over Brunswick Green and re-numbered her back to D335. Yellow warning panels were applied during the 1992 running season. During 1995, Crewe Basford Hall Yard held its second open day event and invited three members of the Class along, namely 212 Aureol, 40135 and the group second locomotive 40145. During April 1998, the loco suffered serious power unit damage and as a result was out of traffic for over two years, not returning until September 2000 when she took part in the ELR diesel gala. Following this event the loco was again taken out of traffic for minor bodywork attention and a full repaint into BR blue livery. Today 40135 can be seen hauling trains on the ELR together with sister loco 40145 which is also owned and operated by the same organisation. In January 2006 a decision was made to re-paint the locomotive back into 1960's Green livery and numbered D335. D335 has twice had the honour of hauling the East Lancashire Railway diesel dinner Friday the 27th of September 2013 and Friday the 7th of March 2014. 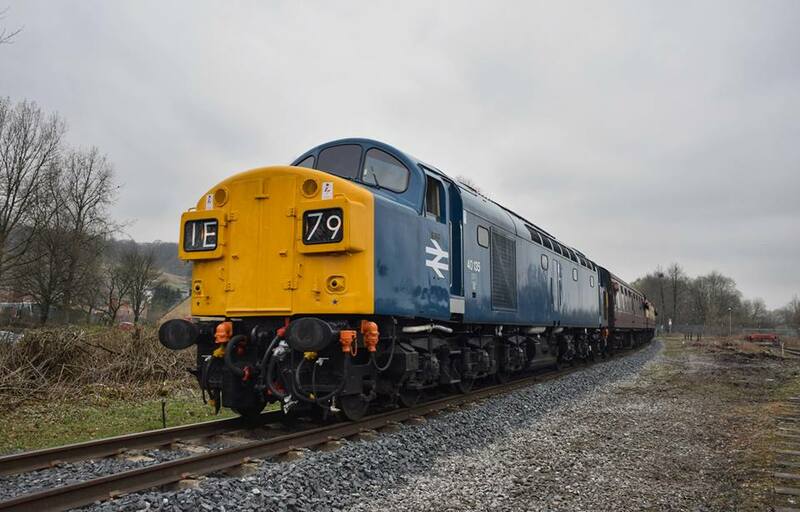 D335 took part in the Nene Valley Railway diesel gala over the weekend of the 16th-18th of May 2014 along with Class 47, D1501 and Class 37, 37324 'Clydebridge'. Following the Autumn Diesel Gala appearance, including AC Electric Drags with 86259, On 29 September 2014, D335 was taken out of traffic at the Eat Lancs Railway for a C Exam, General Repairs, deep clean and repaint along with bodywork repairs. The loco is expected be out of traffic for 12 Months for the work to be completed and is pencilled in for the Autumn Diesel Gala 2015 return to traffic. ​40135 Appeared at the ELR Class 40's 60th Anniversary Event held on 13th to 15th April 2018 with class mates D200, 40012, D213, 40106 and 40145. 04:66 London Midland Western Lines. 22:01:85 at Newton Heath depot. 08:05:85 at Crewe Diesel depot and numbered 97406. Owned by :- The Class 40 Preservation Society ( CFPS ). Based at :- East Lancs Railway, Bury, Lancs.